So, who wants spinach and fennel fronds for dinner? What, no takers? Spinach and fennel fronds don’t sound like dinner to you? So as everyone is probably now painfully aware, our new “thing” is making our way through obscene amounts of produce – it’s the challenge we now face every week, and each week is full of new possibilities. I’m starting to make things I never imagined I would. Because I refuse to let ANYTHING we get in our CSA share go to waste, I couldn’t bear to think about throwing away the beautiful fennel fronds that, of course, came with our farm-fresh fennel this week. So I didn’t throw them away. I saved them. They’d been sitting in the fridge in a grocery bag since Wednesday night, just waiting for their time to come. The subtle anise scent they gave off was just too tempting, and I had spent most of the weekend thinking about them. When I first made the decision to save them, I thought maybe I’d be traditional and use them as a garnish for something (maybe a nice piece of salmon?). That just seemed to easy – come on fennel fronds, bring it on! I knew I could do something more fun with them. 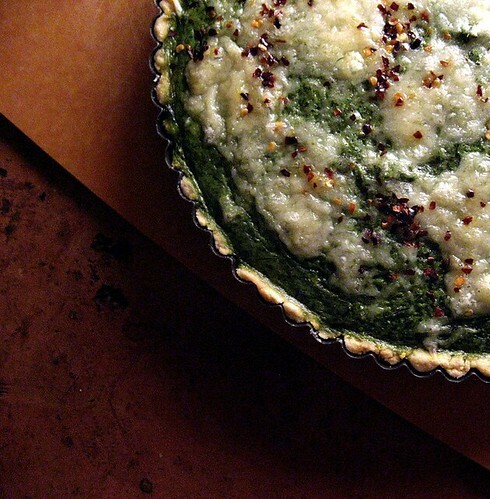 I spent much of this past weekend thinking it over (as I seem to do these days re: using up our veggies), and finally this morning it dawned on me – why not try making a tart with some of these leftover greens? 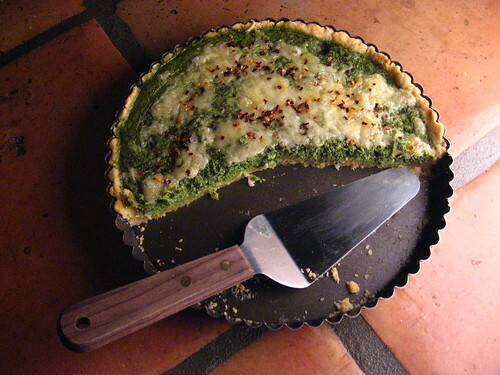 I started browsing some of my favorite recipe blogs, looking for a good basic spinach (or other “greens”) tart to use as a base for my own take on a green tart. 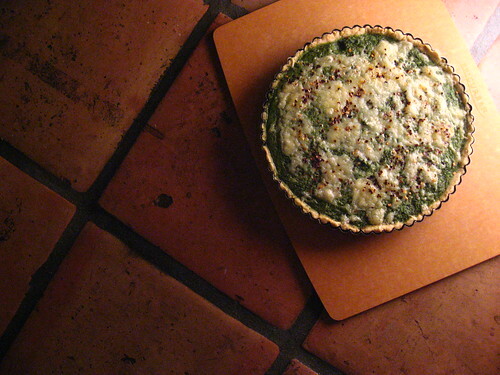 I finally settled on modifying Heidi Swanson’s (101 Cookbooks) recipe for a Turnip Green Tart. You know what? I can’t lie. I was skeptical about eating a “Green Tart”. How good could it really be? Fennel fronds and a handful of spinach… really? Well, now I know NEVER to throw away my fennel fronds again. They have such an amazing and unique flavor, why don’t more people use them??? I really couldn’t be happier with how my Green Tart turned out. I can actually imagine using this as a base recipe for the future when I have greens I need to use up. Yay for new discoveries! Start by making the tart dough. Combine flour, cornmeal, and salt in a food processor. Add in the butter and process until the mixture resembles sandy pebbles. Add the egg yolk and drizzle in the water. Add more water if needed, just until dough comes together. Turn out onto a floured counter top and gather into a ball. Press it into a 1/2-inch thick disk, and wrap in plastic. Chill for about an hour. Preheat the oven to 350F. Place a rack in the middle of the oven. When you’re ready to line the tart pan with dough, place your dough disks on a lightly floured surface and roll out until the dough is large enough to line your tart pan. Transfer the dough to the pan. Ease the dough into place, taking care not to stretch it too thin or rip it (though if you do, you can always patch it up. I had to…). Press the dough along the bottom of the pan, out to the walls, and against the sides. Trim away the excess dough. So you don’t end up with a soggy mess, you want to partially bake the tart shell before filling it. 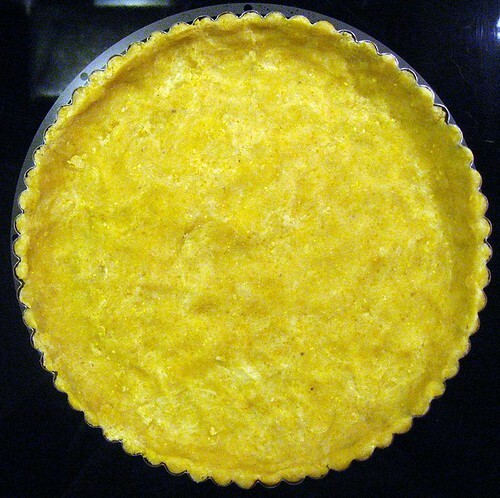 Using a fork, make small holes along the bottom of the tart shell. Line the shell with parchment paper and fill to the rim with pie weights (or dried beans), and bake it in your preheated oven for about 25 minutes. At the 25 minute mark, remove the pie weights and put the shell back in the oven for another 5 minutes, or until the crust is dry and just barely starting to brown. 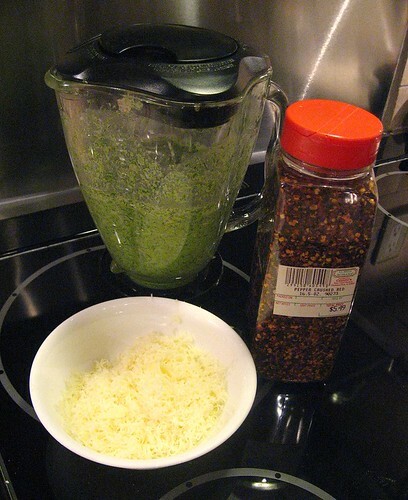 Chop the greens and toss them into a blender. Add the garlic cloves, eggs, broth, cream, salt, mustard, and herbs. Blend it all together until it’s smooth. When you’re ready to bake, fill the tart shell with the filling and bake for 30-40 minutes or so, or until the center is set, and has firmed up to the touch. About 2/3 of the way through I followed Heidi’s lead and sprinkles the tart with a bit of cheese (swiss) and crushed red pepper. Yum! Let it sit for a few minutes (5-10) before serving. As it cools slightly it will further firm up. Emily, I am so looking forward to returning to Canada and trying some of these interesting recipes. Here I am without my food processor and other important kitchen “gadgets/machines”. This recipe looks delicious. Did you try to freeze the leftovers? Love it! it looks stunning. It is good to know I am not the only person in the world dreaming of using up all my vegies and beautiful fennel fronds. However you have bet me to it in making this. 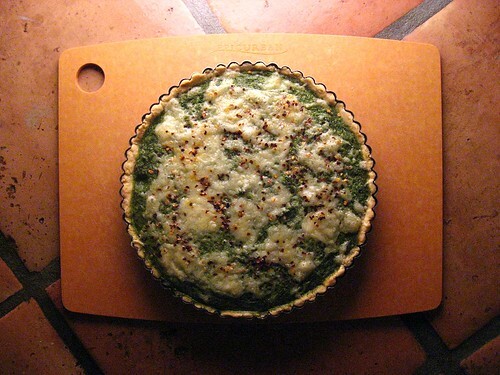 I am totally inspired, I just spotted recently a wild green pie in Tessa Kiros Greek cook book that reminds me of yours.